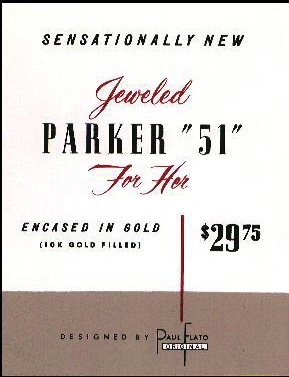 Around 1953, Parker experimented with a new version of the Parker “51”, which has come to be known as the “Princess”. This pen had a gold filled cap and barrel, the same size as the Parker “51” Demi Signet. Unlike the Signet, the cap and barrels did not have a lined pattern, and instead had a smooth finish. In addition, the pens were fitted with “jewels”, which in reality were just rhinestones, in a variety of shapes and colors. The jewels were fitted to the cap into holes cut to the shape of each individual jewel. 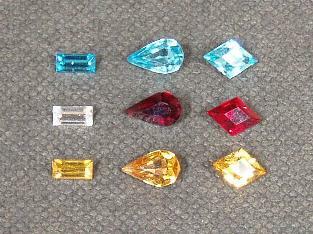 Jewels came in baguette, teardrop and diamond shapes, in either blue, clear, red or yellow. The most common color found is clear, in teardrop and baguette patterns. In addition, all pens that have been found have a matching round color jewel also fitted to the top of the cap. Most of the pens also have a jewel at the end of the barrel, although some have been found with just rounded barrels and no jewels. The “51” Princess appears to have only been test-marketed in certain areas and never went into regular production, although the test program must have been well into the advanced stages, as a unique velvet covered box was designed just for the Princess and a recent discovery of a point of sale card, complete with price, seem to indicate. The number of examples that have been found is very limited and most seem to come from the mid-west. Paul Flato, the innovative American jeweler whose diamonds were worn by Hollywood stars like Greta Garbo, Rita Hayworth and Merle Oberon, died July 17 in a nursing home in Fort Worth. He was 98. Mr. Flato began his career as a watch salesman in New York in the early 1920’s and soon opened his own jewelry business on East 57th Street in Manhattan. Within a short time he was one of the best known jewelers in New York. Inspiration came from everything from a fallen leaf to museum paintings and furniture. A compact for Elizabeth Arden took shape in his mind after he saw a rush-bottomed chair in the Metropolitan Museum of Art. He fashioned platinum and diamond jewelry in flowers, ribbons and scrolls. An apple blossom necklace for Lily Pons, the opera singer, wrapped around the neck and opened in the front with diamond blossoms cascading on either side. A rose became a rambler that twined around the wrist on a baguette-cut diamond stem sprouting rose-cut diamond buds. In addition to creating ”important” pieces, Mr. Flato was an early proponent of whimsical jewels. Among them were a diamond ”corset” bracelet, with garters in rubies and diamonds, based on Mae West’s undergarment; a bracelet, aptly named the ”gold digger,” featuring a gold pickax, and black enamel sign language initial clips for Katharine Hepburn, among the many pieces he did for the 1938 film ”Holiday.” A compact for Gloria Vanderbilt was studded with gold and enamel angels, including an angel on a chamber pot. A pair of little brooches of gold feet with ruby toenails was originally made for Irene Castle, a play both on her maiden name, Foote, and her dancing career. Mr. Flato was born in 1900 in Shiner, Tex., and attended the University of Texas in Austin. He moved to New York in the early 1920’s to attend medical school, but his plans were thwarted when his father, a Texas cattleman, ran into financial trouble. Later in life, Mr. Flato was convicted of fraudulently obtaining and disposing of jewels from colleagues. He spent many of his last years in Mexico, where he first went in 1945 after pleading guilty and serving 16 months in a federal prison for obtaining jewels on consignment from fellow jewelers and pawning them. He lived there for almost eight years, fighting extradition on further charges of grand larceny and forgery involving more than $60,000 in gems that had been entrusted to him by dealers. He returned to the United States in 1953. In 1970, he returned to Mexico, opened a jewelry shop in Mexico City and spent two decades there, returning to Texas in 1990.